Lara Santoro, a veteran journalist, discusses her first novel, Mercy, a tragic and powerful story of what it is like to die of AIDS in Africa. Mercy offers a glimpse into the role played by the pharmaceutical industry and the US government against the interests of an entire continent, and gives a name and face to the AIDS epidemic in Africa. This is a story Santoro has seen played out many times in her prize-winning coverage of Africa for Newsweek and the Christian Science Monitor. Her work has also appeared in The Wall Street Journal, The New Republic and the London Sunday Times. Lara Santoro is most recently the author of Mercy, a novel. 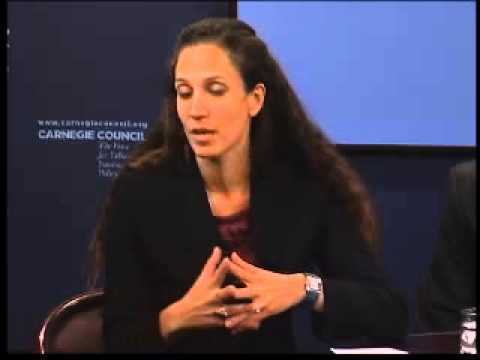 She spent most of her career as a foreign news correspondent, based primarily in Rome and in Nairobi working for Newsweek and The Christian Science Monitor. Her work has also appeared in the Wall Street Journal, The New Republic, The Boston Globe, The London Telegraph, The Times of London and The Sunday Times. She holds a bachelor's degree in Comparative Literature from Smith College, a Master's degree in French Literature from the Sorbonne, and a Master's in Fine Arts from New York University, where she was the recipient of the Developmental Fellowship, a biannual award. She was born in Rome, and currently lives in New Mexico.